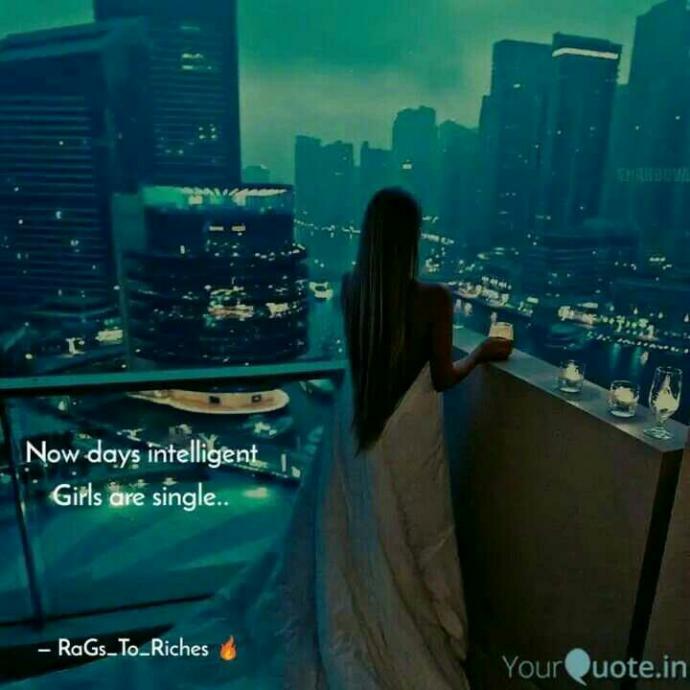 Now days intelligent girls are single. ? Bkoz they are busy in making money. Busy in building career. What you think? Are you a person of integrity? Who’s an Insane or evil character/villain you could oddly relate with? Is it childish to delete friends from Facebook when you're mad at them? What time do you usually go to sleep at night? Do you have any pet names or a nickname? Uh no. You’re trying to rate intelligence based on your own perception of what is the best choice for someone else. No. You’re not automatically intelligent just because you have a career and make money. But yes, a lot of intelligent women (and men) are single and that for various reasons. Yeah, it could be because of a career, because she can’t find someone on her level or it could also be because she realize that men/relationships are a waste of time and emotion these days. Most people (men and women) are selfish assholes who only care about themselves. They cheat and lie and most relationships end in break up. Then what’s the point? Why invest time, energy and emotion (and money) in to someone who is likely to lie to you, cheat on you and then dump you (or behave in a way that you need to break up with them)? Home > Other > Agree or disagree?